We have developed a set of routines that allows to draw easily different maps of the research carried out in a scientific institution. Our toolkit uses OpenSource elements to analyze bibliometric data gathered from the Web Of Science. We take the example of our institution, ENS de Lyon, to show how different maps, using co-occurrence (of authors, keywords, institutions…) and bibliographic coupling can be built. These maps may become a valuable tool for discussing institutions’ policies, as they offer different views on the institution at a global scale. Glänzel, W. (2003). 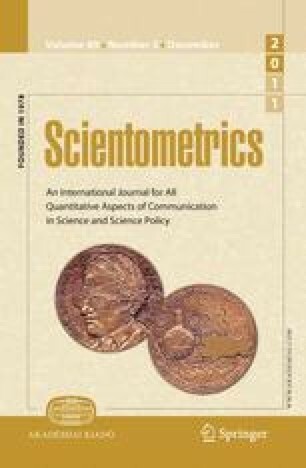 Bibliometrics as a research field: A course on theory and application of bibliometric indicators. http://nsdl.niscair.res.in/bitstream/123456789/968/1/Bib_Module_KUL.pd.